We have teamed up with Revenue to offer employers and payroll bureaus online training webinars to help you prepare for PAYE Modernisation. With just a few short months before PAYE Modernisation takes effect, these online training webinars will discuss how PAYE Modernisation will affect payroll processing and what is expected from you going forward. All webinars are CPD accredited and free to attend. Places are limited. It is much more important to take backups of payroll data with PAYE Modernisation. To help our customers, we are providing a FREE BrightPay Connect 2019 licence with every BrightPay payroll purchase. Users can easily backup their payroll data to the cloud, which can be restored at any time. To assist our customers with the transition to PAYE Modernisation, our customer support will have extended and Saturday opening hours from Monday 17th December until Saturday 16th February including early mornings and evenings. It is important that all employers understand the upcoming changes to the Irish PAYE system. PAYE Modernisation will affect all employers and it will be important to ensure 100% compliance to avoid penalties and fines. Follow these 8 steps to find out what you need to know about submitting your payroll data to Revenue in real time. PAYE Modernisation changes the payroll process forever. Payroll bureaus and accountants should look to increase the prices they charge for payroll and PAYE Modernisation services to compensate for the additional work required. In this guide, we examine the best practices to consider which will improve profits and increase Revenue. PAYE Modernisation Compliance: We’re ready!! Please be assured that BrightPay 2019 will fully cater for the new PAYE Modernisation system and that we aim to make it as seamless as possible for you. Users will be able to seamlessly retrieve RPNs and submit PSRs through to Revenue with just a few clicks. There is no additional charge for PAYE Modernisation. 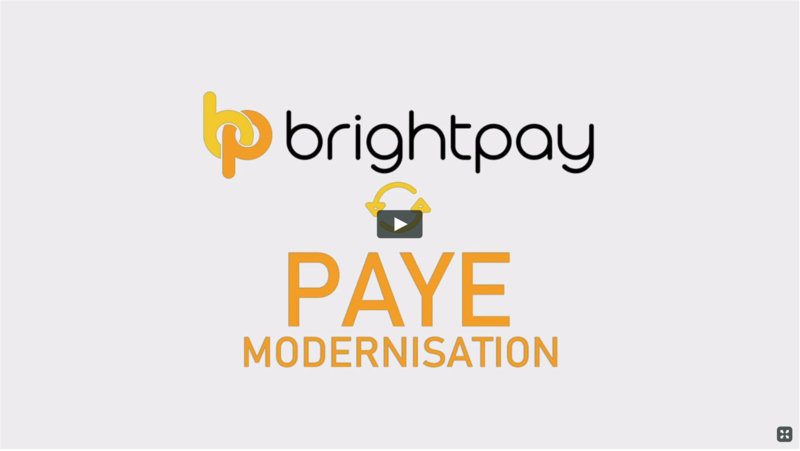 Book a demo to see just how easy PAYE Modernisation will be with BrightPay. With the introduction of PAYE Modernisation, the payroll process will be time consuming, frustrating and costly where businesses use a manual process. PAYE Modernisation is the biggest change to affect PAYE processing since it’s conception. The objective of the new system is to improve the way in which businesses, employees and Revenue communicate with each other. The computer that you run your payroll from will need to have your ROS Digital Cert installed on it. If you are currently able to log into ROS from that computer, then you are fine. Otherwise you should copy the cert (P12 file) from the machine you use for ROS to the machine you use for your payroll. This is something you might want to do in advance of January. You can find help on this here. Are you missing out on the BrightPay newsletter? We will not be able to email you without you subscribing to our mailing list. You will be able to unsubscribe at anytime. Don’t miss out - sign up to our newsletter today!